Hanoi (VNA) - Vietnamese shares fell slightly on both local markets on August 8 as investors tried to take profits from the exchanges’ three-day rallies. The benchmark VN Index on the HCM Stock Exchange dropped 0.18 percent to close at 791.57 points. It had risen total 0.9 percent in the previous three sessions. The HNX Index on the Hanoi Stock Exchange retreated from a three-day increase of 1.4 percent. It inched down 0.12 percent to end at 102.28 points. More than 315.3 million shares were traded across the two local exchanges, worth 4.87 trillion VND (216.7 million USD). 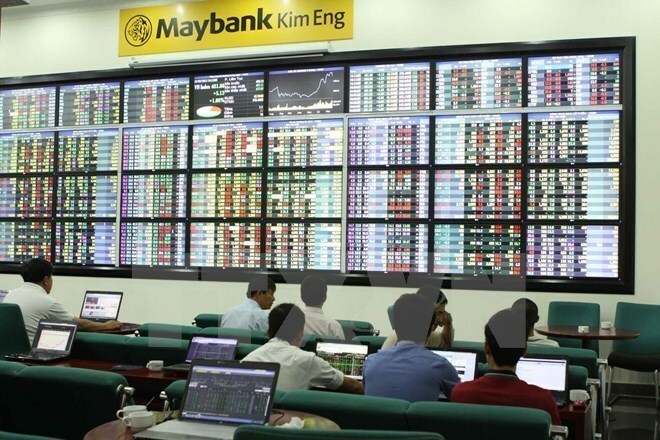 August 8’s trading figures were almost unchanged in comparison with the previous day. Listed companies saw their stocks decline across all key sectors such as banks, financials, brokerages and energy firms as they were hit by investors’ profit-taking. Among the nine listed banks, only shares of Vietcombank (VCB) and Bank for Investment and Development of Viet Nam (BID) advanced. Insurance and brokerage firms saw strong falls in the shares of Bao Minh Insurance (BMI), Vietnam National Reinsurance Corp (VNR), VNDirect Securities (VND), FPT Securities (FTS), Sai Gon-Ha Noi Securities (SHS) and HCM City Securities (HCM). Meanwhile, energy stocks such as PetroVietnam Technical Services (PVS) and PetroVietnam Drilling and Well Services (PVD) were pulled down as oil prices traded in negative territory across Asia markets. Other sectors in which stocks declined sharply and weighed on the market included food and beverages, plastic production, pharmaceuticals, mining and seafood processing. For example, shares of the two sugar producers, Bien Hoa Sugar (BHS) and Thanh Thanh Cong Tay Ninh (SBT) slumped 6.9 percent each, hitting their daily fall limits. Some securities companies have recently stopped lending margins on these two stocks as BHS is near its delisting day, which is on August 31. August 8’s falls on both local markets signaled that stocks were running out of gaining momentum after two weeks and it was necessary for both indices to settle in the short term, Vietnam Investment Securities Company (IVS) said in its daily report. Investor sentiment has become unpredictable and it could have bad impacts on the stock market as the derivatives market would start operating on August 10 with the first two products being VN30 and HNX30 futures, luring investors’ attention from local stocks, IVS said.